Tiiiiiiiiiime is on my side, yes it is! Yes, even though the clock's struck midnight and half the party's dead, you're still alive and can continue to party on. And even if you missed out on the Masque of the Red Death Kickstarter, you can still join in now that late pledges are being taken and the pledge manager is now open. The BackerKit is going to be open until February 23rd, but don’t delay. This is your last chance to be a part of this campaign and receive the deluxe edition! 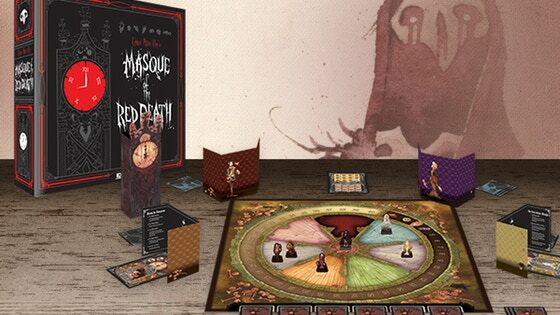 Based on Edgar Allen Poe’s sinister story, Masque of the Red Death pits you and up to six of your friends against each other as you hobnob with the Prince. But disaster strikes at midnight. You must balance your actions carefully between currying the Prince’s favor and discovering which rooms the Red Death will visit. After all, having the highest social standing matters only if you survive.